FARMINGTON, Maine -- You have to follow the curves of Temple Stream to reach the old farmhouse where Bill Roorbach has lived for 14 years. Heading out of Farmington, the route starts on Temple Road and branches to a winding country lane that goes along a fork of the stream. A bit uphill, sitting on the left and close to the road, is the modest 132-year-old home Roorbach, a writer and teacher, shares with his wife, Juliet Karelsen, an artist, and their daughter, Elysia, who is almost 6 . Out back, down the sloping backyard, past the garden, and through the western Maine woods -- ``400 paces altogether," Roorbach writes -- is the stream, ``our point of contact with all the waters of the world." 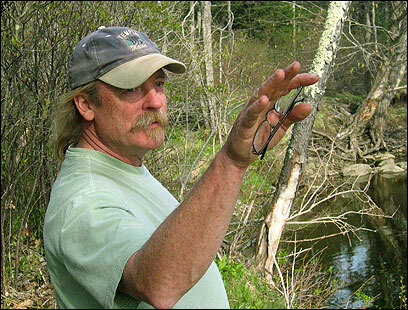 Roorbach, 52, chronicled his relationship with the water, the woods, and the state in his eighth book, ``Temple Stream: A Rural Odyssey " (Dial Press, 2005). Out in paperback this summer, it won the 2006 Maine Literary Award for best nonfiction book. Roorbach also writes novels, short stories, essays, and has two instructional writing books to his credit. In the fall, he will start his third of five years as holder of the Jenks Chair in Contemporary American Letters at the College of the Holy Cross in Worcester, Mass., where he teaches writing. While Roorbach is soft-spoken in person, his writing booms with delight in the outdoors. That exuberance has been quieted somewhat by events of the past half year, however. In April, his mother, Reba Roorbach, to whom he credits his love of the written word and of nature, died after a long illness. And the two beloved family dogs, Wally and Desi, who appear in many of his essays and books, and for years accompanied Roorbach on hundreds of walks, died within a few months of each other. ``My mother was a real nature person. She always had a stick to show you or an insect or a cool rock or a plant in the sink. I've been very sad," Roorbach said. But on this sunny, warm day blanketed in new-spring green, Roorbach is happy to lead a walk through the woods and along Temple Stream. Joining us are fellow nature lovers Drew Barton and Robert Kimber, friends with whom Roorbach frequently enjoys the outdoors and who play important roles in the book. Kimber, 71, also a writer, is an expert outdoorsman. He's the old-timer, having moved here with his wife in 1971. His house, too, sits near Temple Stream, which is a tributary of the Sandy River. ``One day I called Bob and said, `There's a bald eagle coming up the stream, ' and he said, `Yep, there it goes,' " Roorbach recalled. Kimber, Roorbach, and their poet friend Wesley McNair published a trio of essays titled ``A Place on Water," about their connection to nearby Drury Pond and to each other. ``We're in the foothills of the foothills of the White Mountains," Roorbach said as we headed out, equipped with day packs and binoculars. Our hiking destination was not lofty -- the top of Potato Hill, a.k.a. Tater Mountain, about 1,500 feet up -- but the journey was supreme as we tromped through the woods with all the abandon of children. ``Look at that wake-robin trillium!" Roorbach said as if discovering gold. He bent down to examine the small plant's large burgundy leaves. ``Those there are horse tails," he said pointing to needle-sprouting stalks. ``They're also called scouring rush because they're coated with silicone and were used for scouring pots." More names are called out -- clintonia, false Solomon's seal, hobblebush -- as Barton checks for verification in his well-thumbed ``Newcomb's Wildflower Guide." The men lament the ruts in the ever-widening path made by drivers of all- terrain vehicles. ``It's become a big issue," Barton said. ``For skiing, though, this is heaven," Kimber added. Whatever the topic of conversation, it ceases immediately with the chirp of a bird. Binoculars are raised with lightning speed as they search for the source. This they do when they spot a black-throated green warbler, a yellow-rumped warbler, a chickadee. ``Look, there's the blue-headed vireo, Bob!" Roorbach called out a little later. ``Where? Where? Where?" Kimber shouts. ``Way in the top of that tree," Roorbach said, pointing up. ``I don't see it. I really need to see one," Kimber said, disappointed at missing this opportunity. ``They're cool," Roorbach said. ``Blue head, green back, and white spectacles." We leave the path and bushwhack our way up the hill. The men point out signs of past farms -- a stone wall here, two outstretched maples there. Branches snap and crackle under our boots. On the flat, rocky top of Potato Hill, we eat sandwiches and gaze at Mount Blue, Mount Abraham , Saddleback Mountain, Day Mountain. ``On the other side of Mount Blue you can see the Presidentials," Roorbach said. Back down the other side of the hill, we reach a beautiful bend of Temple Stream where water is rushing over large rocks. Roorbach canoed -- and portaged -- much of the stream. We follow it, now several feet below us, until we reach the car. Five hours have passed. Back home, Roorbach leads the way down to his family's part of Temple Stream, which he visits at least twice a day. Out here he has seen beaver, muskrat, bald eagles, bard owls, coyotes. As he talked, he spotted something in the water. ``Look, a snapping turtle!" he cried. ``Well, I'm not 100 percent sure. I'm going to have to look him up. That's only the second one I've seen there in 15 years! Ooh, ooh, I want to go get him." He looks up as if an explanation is necessary. ``I guess it's a little boy thing," he said. Contact Diane Daniel at diane@bydianedaniel.com.